Fabtech specializes in Pharmaceutical Sterilization Tunnel. It is a fully automated system which utilizes dry heat and forced convection of filtered air to achieve sterilization and depyrogenation of containers, vials, bottles and ampoules. Vinyl Curtain / Polycarbonate enclosures on all sides. 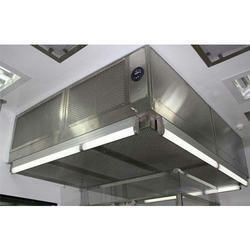 SS Perforated Safety Grill for HEPA Filter. 5/15 Amp single-phase switch socket. Audio Visual Alarm indicating condition of HEPA Filters. Looking for Pharmaceutical Sterilization Tunnel ?